In 1881–1882, Marx undertook extensive historical studies, covering a large part of what was then known as “world history”. The four large notebooks with excerpts from the works of (mainly) two leading historian of his time, Schlosser and Botta, have remained largely unpublished. In this article, Marx’s last studies of the course of world history are contextualized: Marx’s previous historical studies and his ongoing, but unfinished work on the critique of political economy. The range and scope of his notes is astoundingly broad, going far beyond European history and actually covering many other parts of the world. Marx’s focus in these studies supports the interpretation offered in the article: that the author of “Capital” was fascinated by the long process of the making of the modern states and the European states system, one of the crucial prerequisites of the rise of modern capitalism in Europe. I first encountered Moishe Postone‘s work on antisemitism in the early 2000s but it wasn’t until 2008-9, when the United States was in the grips of a financial crisis, that his thinking on Marx, capitalism, and value really began to hit home. I remember making zines out of his essay, “Critique and Historical Transformation“, and distributing them in New York City to students, activists, and friends, in the hopes of starting a more critical conversation on the crisis. The point was to go beyond superficial analyses of “crony capitalism” and to see the totality of capital as a self-mediating, crisis-prone dynamic of value which cannot simply be opposed to labor. Furthermore, Postone’s critical theory challenged those of us who became politicized in the ‘anti-globalization’ movement and the anti-war movements of the late 90s and early 00s. This paper answers fundamental questions that have preoccupied modern economic thought since the 18th century. What is the aggregate real rate of return in the economy? Is it higher than the growth rate of the economy and, if so, by how much? Is there a tendency for returns to fall in the long-run? Which particular assets have the highest long-run returns? We answer these questions on the basis of a new and comprehensive dataset for all major asset classes, including—for the first time—total returns to the largest, but oft ignored, component of household wealth, housing. The annual data on total returns for equity, housing, bonds, and bills cover 16 advanced economies from 1870 to 2015, and our new evidence reveals many new insights and puzzles. Marx Collegium 2017 – After the eruption of the international financial crisis in 2008, Marx’s Capital received renewed academic and popular attention. Leading newspapers throughout the world discussed again the contemporary relevance of its pages. Faced with a deep new crisis of capitalism, many are now looking to an author who in the past was often wrongly associated with the “actually existing socialism”, and who was hastily dismissed after the fall of the Berlin Wall in 1989. For many scholars, today Marx’s analyses are arguably resonating even more strongly than they did in Marx’s own time. This international conference brings together several world-renowned sociologists, political theorists, economists, and philosophers, from diverse fields and 13 countries. Its aim is to explore diverse scholarly perspectives and critical insights into the principal contradictions of contemporary capitalism and, in so doing, to draw attention to alternative economic and social models. 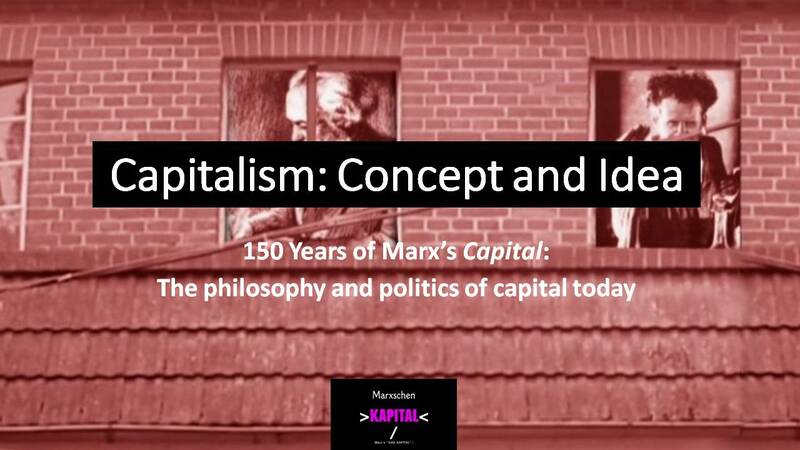 The presenters will critically reconsider Marx’s Capital as a work that continues to provide an effective framework to understand the nature of capitalism and the transformations of our times. The Department of European and International Studies (School of Politics & Economics, King’s College London), along with the www.thenextrecession.wordpress.com blog, organised a major international conference – titled Capital.150: Marx’s ‘Capital’ Today – to mark the 150th anniversary of the publication of Karl Marx’s text Capital: A Critique of Political Economy. The conference took place on 19-20 September, 2017. It attracted from around the world some of the leading scholars and research networks in the field. There were lively debates among speakers and audience on the roots of the global economic and financial crisis, contemporary imperialism, and the prospects of global capitalism. David Harvey and Michael Roberts debated how to map the terrain of anti-capitalist struggles in the plenary of the evening of September 19. The same topic re-emerged throughout the conference as participants investigated the nature of the present political conjuncture and the prospects for the labour movement. Leading Marxist scholar David Harvey discusses the profound insights and enormous power Marx’s analysis continues to offer 150 years after the first volume of Capital was published. His latest book is Marx, Capital and the Madness of Economic Reason. David Harvey (@profdavidharvey) is Distinguished Professor of Anthropology at the City University of New York Graduate School and an Honorary Graduate of LSE. His course on Marx’s Capital, developed with students over thirty years, has been downloaded by people from all over the world. Hyun Bang Shin (@urbancommune) is Associate Professor of Geography and Urban Studies at LSE. The LSE Department of Geography & Environment (@LSEGeography) is a center of international academic excellence in economic, urban and development geography, environmental social science and climate change. Of course the method of presentation must differ in form from that of inquiry. The latter has to appropriate the material in detail, to analyse its different forms of development, to trace out their inner connexion. Only after this work is done, can the actual movement be adequately described. If this is done successfully, if the life of the subject-matter is ideally reflected as in a mirror, then it may appear as if we had before us a mere a priori construction. My dialectic method is not only different from the Hegelian, but is its direct opposite. To Hegel, the life process of the human brain, i.e., the process of thinking, which, under the name of “the Idea,” he even transforms into an independent subject, is the demiurgos of the real world, and the real world is only the external, phenomenal form of “the Idea.” With me, on the contrary, the ideal is nothing else than the material world reflected by the human mind, and translated into forms of thought. The mystifying side of Hegelian dialectic I criticised nearly thirty years ago, at a time when it was still the fashion. But just as I was working at the first volume of “Das Kapital,” it was the good pleasure of the peevish, arrogant, mediocre Epigonoi [Epigones – Büchner, Dühring and others] who now talk large in cultured Germany, to treat Hegel in same way as the brave Moses Mendelssohn in Lessing’s time treated Spinoza, i.e., as a “dead dog.” I therefore openly avowed myself the pupil of that mighty thinker, and even here and there, in the chapter on the theory of value, coquetted with the modes of expression peculiar to him. The mystification which dialectic suffers in Hegel’s hands, by no means prevents him from being the first to present its general form of working in a comprehensive and conscious manner. With him it is standing on its head. It must be turned right side up again, if you would discover the rational kernel within the mystical shell. In its mystified form, dialectic became the fashion in Germany, because it seemed to transfigure and to glorify the existing state of things. In its rational form it is a scandal and abomination to bourgeoisdom and its doctrinaire professors, because it includes in its comprehension and affirmative recognition of the existing state of things, at the same time also, the recognition of the negation of that state, of its inevitable breaking up; because it regards every historically developed social form as in fluid movement, and therefore takes into account its transient nature not less than its momentary existence; because it lets nothing impose upon it, and is in its essence critical and revolutionary. The contradictions inherent in the movement of capitalist society impress themselves upon the practical bourgeois most strikingly in the changes of the periodic cycle, through which modern industry runs, and whose crowning point is the universal crisis. That crisis is once again approaching, although as yet but in its preliminary stage; and by the universality of its theatre and the intensity of its action it will drum dialectics even into the heads of the mushroom-upstarts of the new, holy Prusso-German empire. It is in this serious light that we have to look at the question of the growing army of the unemployed. We have to stop looking for solutions in pump-priming, featherbedding, public works, war contracts, and all the other gimmicks that are always being proposed by labor leaders and well-meaning liberals.